Dreamy sounds can be yours with the M-Tron Pro. 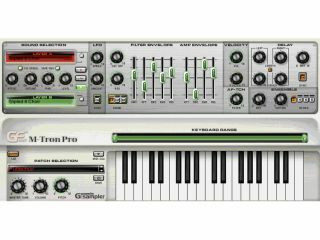 GForce has finally launched the M-Tron Pro - a software instrument that MusicRadar first glimpsed way back in January at the 2008 Winter NAMM Show. The plug-in's name gives you a pretty good idea of what it sounds like: Mellotron sounds are its forte. However, this successor to the original M-Tron is more than just a straight emulation. The M-Tron Pro comes with over 200 tape banks (which are actually sample sets), 19 of which were included with its predecessor. 45 of the banks are completely new, and 700 presets are included. In total, the sample library weighs 3.5GB. The instrument's sound can be tweaked with 29 synth-style parameters per layer (you can have two). There are ensemble and delay effects, a low-, high- and band-pass filter section, and tape reverse/half-speed options. M-Tron Pro is being distributed by GForce, and the company's marketing director Adam Castillo believes that it's "the holy grail of classic '60s and '70s sounds". He also says: "It offers customers a faithful reproduction of the classic Mellotron instrument, plus a powerful suite of digital sculpting tools and parameters. "It's perfect for musicians and producers who want to shape their own custom sounds - taking vintage inspiration into the future." Available from today, M-Tron Pro is Mac- and PC-compatible and supports the VST, AU and RTAS plug-in formats. It costs $200/€139/£109, though owners of the first M-Tron can upgrade for €59 via the GForce website.